UNITED STATES: Danish engineers Semco Maritime and US infrastructure advisors Moffatt & Nichol will work together to supply high-voltage substations for offshore wind projects. The two firms will also offer "common engineering services" and wind farm concept studies to the US offshore wind sector, the companies announced. Moffatt & Nichol is an advisory firm that has previously designed substructures to support wind turbines, met mast towers and substation platforms for the offshore wind industry. It also designed the electric service platform (ESP) for the cancelled 468MW Cape Wind project off the coast of Massachusetts. 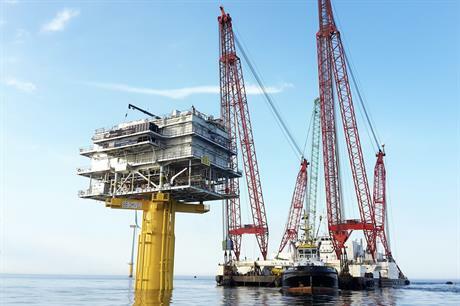 Semco, meanwhile, is an engineering, procurement and construction (EPC) contractor, which helped provide the substation for the 165MW Nobelwind project, and was awarded an EPC contract for Ørsted’s 1,386MW Hornsea Two site. It is also part of a similar partnership targeting the Taiwanese offshore wind sector. Tommy Flindt, director of technology at Semco, said: "We believe that US offshore wind will enter a growth trajectory similar to what has been seen in Europe and we also believe that a combination of nearly two decades of offshore wind experience couple with knowledge of US practices, codes and regulations, and engineering experience will be a win-win for our customers." The US currently has just the one offshore wind project, the five-turbine 30MW Block Island site off the coast of Rhode Island. But in recent months a number of north-eastern states have announced plans and targets for future offshore wind deployment.